On February 13 took place the XIV Rice Workshop at Deltebre (Spain). 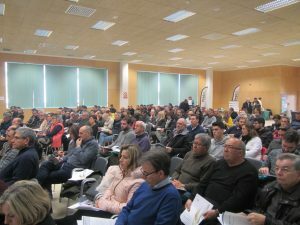 IRTA researcher Mar Català organised the event, attended by 250 people. 25% of the attendees to the event were part of the scientific community; 60% were part of the industry; and 15% were policy makers and authorities. During the workshop, researchers presented their works on direct dry seeded rice production, intermittent irrigation and gas emission; evaluating the agronomic impact on the crops. Speakers also adressed magnaporthe grisea, an illness that had a strong impact at El Delta de l’Ebre. IVIA researcher Concha Domingo talked about the origin of rice varieties that we raise. The presence of collaborators’ stands enriched the workshop and brought market innovations closer to the sector.